How to identfy an Inter-Mediates release? The game disk has a white label carrying the Magnetic Scrolls logo, the name of the game, the target platform and a copyright notice which is (normally?) dated to 1989, also for the earlier released games. The game boxes are often relabeled. The orginal sticker with the target platform is pasted over with a new white sticker. 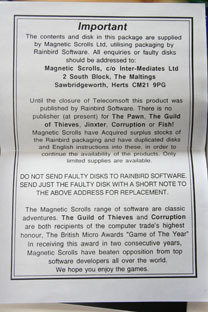 The boxes contain a note explaining the change in distribution and a demand not to return defective disks to Rainbird, but Inter-Mediates instead. 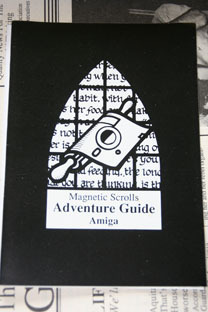 The game manuals are sometimes reproductions. These reprinted manuals have a black coloured cover instead of the original blue. Game feelies, especially the hard-to-reproduce ones, might be missing, e.g. the die of The Guild of Thieves or the beer mat of Jinxter.